SHANGHAI, March 23, 2018 /PRNewswire/ — Exhibition Organizers from over 165 countries are already scheduled to participate in the first China International Import Expo (CIIE), which will take place at the National Exhibition and Convention Center in Shanghai from November 5-10, 2018. The first CIIE is also expected to attract upwards of 150,000 buyers from China and across the world. Created to serve as a platform for the promotion of global trade, more than 1,300 companies from over 120 countries and regions, including dozens of Fortune 500 companies and leading companies from all industries, have already registered for the event. So far, companies from Asia represent 35 percent of exhibitors, followed by Europe with 32 percent, the Americas with 16 percent, Oceania with 11 percent and Africa with 6 percent. Information technology giant Dell will showcase its world-leading innovations and solutions in the area of high-end, smart equipment. Microsoft will display its latest R&D result – HoloLens, which will project 3D effects with a first-person view. Global food company DANONE will introduce its infant formula milk powder, high-end mineral water, medical nutrition products and organic products to Chinese consumers to satisfy people’s increasing demand for high-quality products. Official figures show that imports into China in 2017 totaled almost RMB 12.5tn (USD 1.95tn), an 18.7% increase compared to 2016. This figure is expected to rise to USD 8tn over the next five years as China, the world’s second largest economy and second largest importer, continues its progression into new stages of development. Supporting the development of international trade is a top priority for the Chinese government, and CIIE is seen an important part of this strategy, with Wang Yang, member of the Standing Committee of the Political Bureau of the CPC Central Committee, highlighting the coming event during his remarks at this year’s first annual session of the 13th National People’s Congress. Zhong Shan, Minister of Commerce, used an often-used musical metaphor to stress that CIIE is not a Chinese “solo” but an international “chorus”. Other governments and major international trading organizations also recognize the importance of CIIE. Japan external trade organization has reserved 10,000 square meters for exhibition, the U.S.-China Business Council has booked more than 2,500 square meters for exhibition, while Brazilian organizer FIESP will bring over 70 companies. 4 exhibition organizers from Australia have booked a total area of over 1,000 square meters. The Singapore Business Federation, the Ministry of Commerce of Thailand and the Indonesian Chinese Chamber of Commerce have all reserved an area of more than 1,000 square meters. In addition, nearly 100 companies from 25 Least Developed Countries (LDCs) have registered. The French government will send senior officials and a large corporate delegation; the Russian government has accorded great importance on CIIE and set up a special coordination committee; and the German Federal Ministry for Economic Affairs and Energy said that Germany will actively use CIIE’s platform to showcase their products and services. 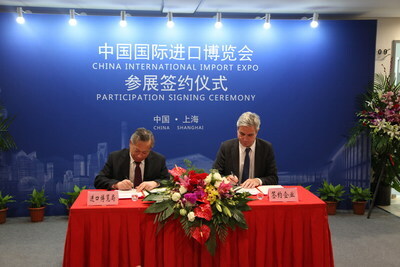 The first China International Import Expo is hosted by the Ministry of Commerce of the People’s Republic of China and the Shanghai Municipal People’s Government, and is supported by the World Trade Organization, the United Nations Conference on Trade and Development and the United Nations Industrial Development Organization.